Kingfisher's Q2 results released today reveal a 2.6% increase at B&Q, while Screwfix storms ahead, up 28.3%, boosted by the opening of 11 new trade counters during the period. LFL sales of outdoor and seasonal products were up 1.3% for the period. In showroom, LFL sales were up 2.6%, with LFL sales of indoor products, excluding showroom, up 5.1%. 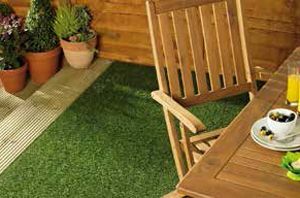 B&Q also reported a strong performance in flooring, including hard wood, laminate and artificial grass. Hand tool sales were also up for the 10-week period at +11%. The increases in Q2 lifted B&Q UK & Ireland's performance during the first half, with total sales up 0.3% and LFL up 0.9%. Kingfisher stablemate Screwfix recorded a strong performance during the quarter, with a total sales increase of 28.3%, up 16.7% on a LFL basis. The chain's store-opening programme maintained momentum during the quarter, with 11 new outlets commencing trading - equating to around one trade counter opening every week. Its portfolio now stands at 412 outlets. The latest results further boost Screwfix's performance in H1, with total sales up 27.5% and LFL revenue up 16%. Internationally Kingfisher's Castorama business in France reported LFL sales of seasonal products up 8.3% with LFL sales of non-seasonal products broadly flat. Its other French retail business, Brico Dépôt, continues to be impacted by a soft house building market, said the firm. In Poland LFL sales of seasonal products were up 16.5% in Q2, with LFL sales of non-seasonal products up 2.9%. Kingfisher chief executive officer Véronique Laury said of today's results: "We have delivered a solid Q2 sales performance to date across all our major businesses, albeit against softer comparatives than in Q1. I am also very pleased to report that the pilot of our unified IT system, which is a key enabler of our 'ONE' Kingfisher plan, started on time in Ireland. We look forward to updating on further progress against our first 'sharp' decisions in September. And we have to date returned £138m to shareholders via a share buy back since the year end."